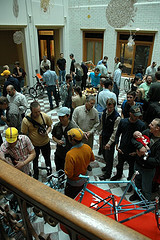 On Saturday, March 3, 2007, JimG, Carlos & I attended the 3rd Annual North American Handmade Bicycle Show in San Jose, CA. This is the second year that the show has taken place in San Jose, and the buzz had been steadily increasing as the weekend of the show grew near. Bicycle builders and related companies had been prepping their finest to put on display in what must be one of the largest collections of active bicycle craftspeople. On Saturday, March 4, 2006, my wife and I attended the North American Handmade Bicycle Show in San Jose. This was the second year of this event, having outgrown their initial location in Texas. Rarely do we have an opportunity to view so many custom builder's works under one roof. We could easily spend time in almost every booth, checking out both sublime and stunning details which these craftspeople have pulled together.